HighTech Garage Doors has both the experience and the mobile capability to install your garage door whenever you need it. If you have an existing garage door that has to be replaced or if you are engaged in a new construction and need a garage door installed, these are tasks that we are able to perform for you at your location in Staten Island, NY. The company can provide you with all of the services that you need to install the garage door you want. With a large selection of garage door types available to us, it is easy for us to give you the door you want that meets the requirements of your project. The garage doors that we have meet the highest quality standard so we know the product you receive will meet your satisfaction. The installation process starts when we sit down with you to discuss what your needs are and the type of door that you want. We will discuss the type of look, appearance of the door, its function and how much it will cost you. A site visit by HighTech Garage Doors professionals to your home or to your business is necessary to get the proper size and provide you with a cost estimate detailing what you need to know about your garage door. 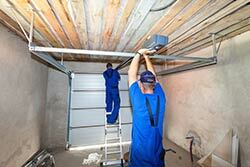 When we complete the estimate, we take care of the installation of your selected garage door. HighTech Garage Doors guarantees that the insulation we provide will give you a door that fits properly and works correctly.